Sonata vs. Elantra: Which sedan is right for you? Santa Fe vs. Tucson: Which SUV is right for you? Alternative energy continues to grab more of the market, and while gasoline-powered vehicles aren’t headed out the door any time soon, the alternative energy options are becoming more and more appetizing for the drivers of Reading, Allentown, and Hamburg. The modern alternative energy vehicle isn’t the somber, boring affair of the past, that couldn’t go far on a long charge. Today’s hybrids and EVs are just as functional and enjoyable as their gasoline-powered siblings, but without the guilt! At Hyundai, they have been aggressive in bringing hybrid drivetrains and electrical power to vehicles across the range of segments. It’s not just tackling different segments that has helped to turn Hyundai into an alternative energy juggernaut – it’s how they offer different energy options within the separate segments as well, not restricting the driver to specific power sources at specific vehicle levels. 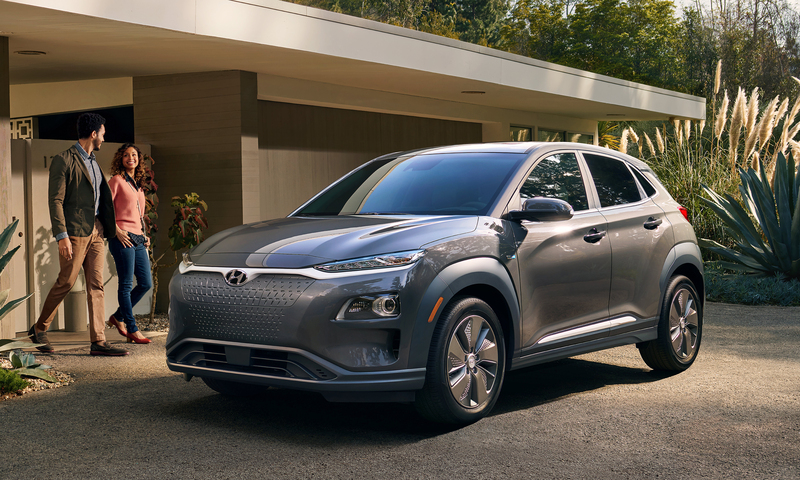 So which 2019 Hyundai alternative energy vehicle is the right fit for you? The 2019 Hyundai IONIQ isn’t the first hybrid compact car. It’s a segment that has been the starting point for nearly every automaker in their forays into the alternative energy vehicles. But never before has the segment seen a vehicle quite like this. Plenty of compact hybrid vehicles are fuel efficient, but with the base Blue trim offering 57 MPG around Bethlehem and 59 MPG on the open road, none of them offer better mileage – and after all, that’s the main reason you’re considering a hybrid, isn’t it? Even the higher trim levels see only a minor dip, down to 55 MPG city and 54 MPG highway. With features such as dual automatic temperature control, Bluetooth hands-free phone, and Android Auto and Apple CarPlay standard even on the base trim, and available leather seating with heated front seats to battle Hazleton winters, it’s got plenty to offer. The cherry on top? 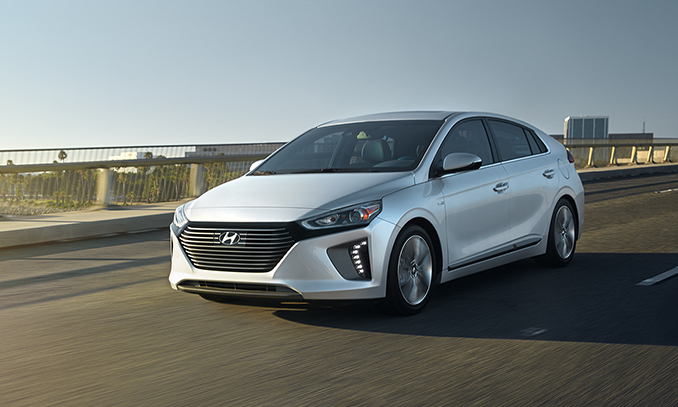 The 2019 Hyundai IONIQ Hybrid offers the lowest starting MSRP of any hybrid compact car on the market, thousands below the competition. If your daily trips are small – maybe you’re just running around Reading on errands, or making a short commute from Bethlehem to Allentown for work. If that’s the case, we’re jealous – but we also have the perfect vehicle. The 2019 Hyundai IONIQ Plug-In Hybrid takes the hybrid vehicle one step further. While the IONIQ Hybrid is hybrid all the time, the IONIQ Plug-In Hybrid allows you to hook up to the power grid and draw power, charging the 8.9kWh battery system that features regenerative braking. This allows for an incredible MPGe rating of 119 MPGe, with an all-electric range of 29 miles when fully charged. With short trips on a full battery, you may never have to pull power from the gasoline engine. At the same time, it has the same features and comforts as the IONIQ Hybrid, including optional wireless device charging. While compact cars are excellent platforms for hybrid power thanks to their small size, that same advantage means it can be hard for drivers with families, or who need room to drive friends and luggage around, to get behind them. With the 2019 Hyundai Sonata Hybrid, drivers in Hazleton and Hamburg don’t need to choose between a roomy interior and great fuel economy – they get both. On the base trim, the 2.0-liter GDI Atkinson cycle engine combines with the electric motor for 151 lb-ft of instant torque, along with 193 combined system horsepower. This helps the Sonata tackle the hills of Bethlehem with ease, while getting 42 MPG combined in the base trim and 41 MPG combined with the Limited trim. With spacious seating, including 56.1 inches of hip room and 56.5 inches of shoulder room in the rear, everyone will be comfortable for short trips as well as longer rides. With available ventilated front seats, high-end woodgrain and tech appearance accents, and available leather upholstery, you can save the Earth while riding in luxury. You won’t just be saving at the pumps either – the base MSRP rivals many conventionally-powered vehicles in the midsize class. 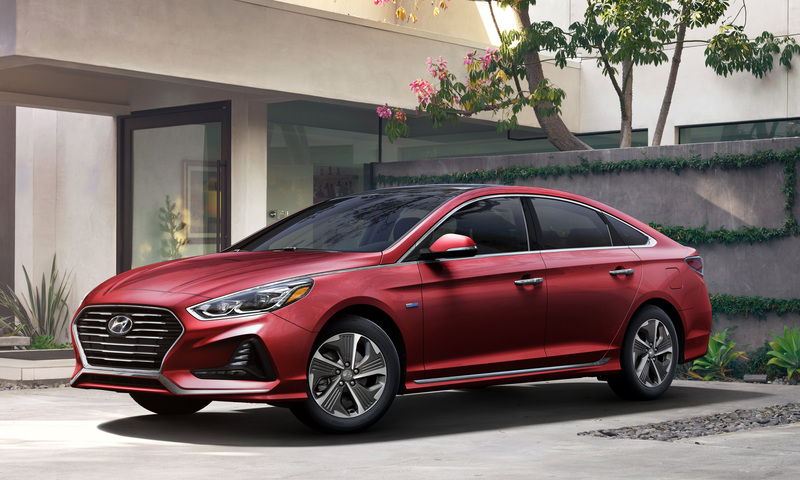 Taking the powertrain from the Sonata Hybrid and adding all-electric capabilities and plug-in charging, the 2019 Hyundai Sonata Plug-In Hybrid brings the midsize car to a whole new level of efficiency. With a higher power output from the electric motor and a larger lithium-ion polymer battery in the trunk, the Plug-In gets 202 combined system horsepower, meaning it will have no problem keeping pace on the Reading highways. At the same time, 39 MPG combined and 99 MPGe makes it incredibly efficient, while 28 miles of all-electric range means you can make quick trips to the store or run errands around Allentown without ever having to engage the gasoline engine. You won’t have to sacrifice comfort to save more either – the Sonata Plug-In offers the same interior space and the same trims and features that you’ll get in the regular Sonata Hybrid. The flexibility of the compact SUV makes it hard to pass up, and it’s why the segment is the fastest-growing automotive segment in the country. So why wouldn’t you offer a model with alternative energy powering it? It’s the best of both worlds in the 2019 Hyundai Kona Electric. This isn’t a mild hybrid that saves you an extra gallon or two around town – with 150 kW Permanent-Magnet Synchronous Motor drawing from a 64.0 kWh battery, this is an SUV that tackles people and cargo with 258 miles of range. The 291 lb-ft of torque from the system means instant acceleration from the stop lights of Bethlehem, from a full charge. Using the onboard charger, you get a full charge in 9 hours and 35 minutes, but through Level III Quick Charge stations, you can get from no charge to 80% in only 75 minutes on a 50-kWh charger, or in only 54 minutes on a 100-kWh charger. In the future, that could mean hooking it up to charge when you get to an Iron Pigs game in Allentown, and it being fully charged halfway through the second inning. With wide back seats and 19.2 cubic feet of storage with the seats up – up to 45.8 cubic feet maximum – it does everything a compact SUV needs to do – just without burning gasoline. The Hyundai Kona EV is set to hit showrooms in early 2019 - so stay in touch to hear more information about the award-winning Kona EV! Alternative energy is cemented in the future of the automotive world. So why not get moving now? You can check out these alternative vehicles right now at Freedom Hyundai of Hamburg and see which one is ready to save to time and money at the gas pumps. And these are just the start – Hyundai is committed to progressively providing more and more alternative energy vehicles in the coming years. Easy to get to from Hazleton, Reading, and the Lehigh Valley, Freedom Hyundai is your best bet to check out the current crop, and get to know the team so they can keep you up to date on the future Hyundai alternative energy vehicles!